FC Cincinnati head coach Alan Koch waves to the crowd after winning a U.S. Open Cup soccer match against the Chicago Fire in June 2017 in Cincinnati. 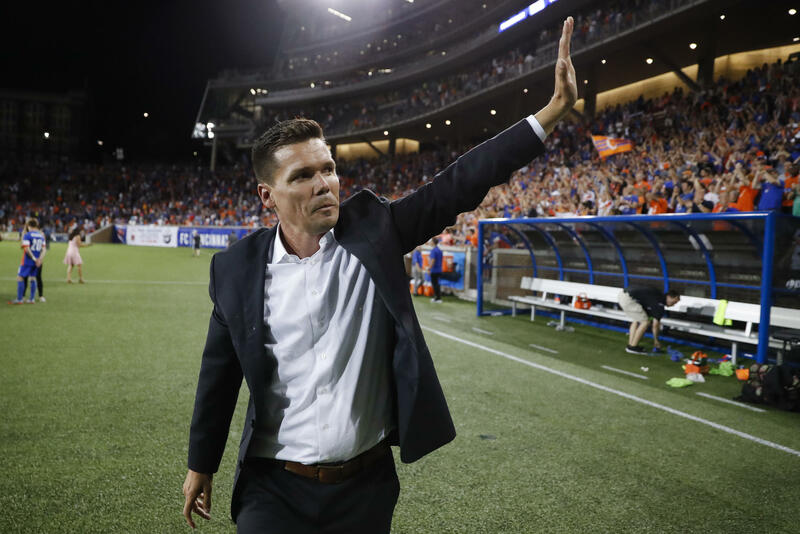 FC Cincinnati has extended the contract of head coach Alan Koch through the 2020 season, a year after the team officially enters Major League Soccer. Koch has led FCC for one-and-a-half seasons, producing a 25-13-15 record. The team currently leads United Soccer League (USL) standings with a record of 13-3-5. FCC was awarded a Major League Franchise in May. In a release, team leadership had nothing but kind words for Koch. "We're so pleased that Alan has committed to our club for the extended future," said Managing Owner and CEO Carl H. Lindner III. "He is a proven winner and brings so many strengths to our club, including a passion to our Cincinnati community and our fans. It's been a pleasure to watch him meticulously rebuild our team and foster a new culture over the last two seasons." President and General Manager Jeff Berding also called Koch a "winner." "We're thrilled for what he's produced on the field, leading us to the best record in the USL, a semifinal appearance in the Open Cup and a stellar record against MLS oppponents. He has an immense dedication to make our club the pride of the Greater Cincinnati Region," Berding said. A native of Durban, South Africa, Koch first joined FCC staff in December 2016 as assistant coach and director of scouting and analytics. He was promoted to head coach in February 2017, where he led the team to a 12-10-10 record and an appearance in the USL Cup Playoffs, where the ultimately lost to the New York Red Bulls in the semifinal round. "This is an incredibly exciting project and, year after year, we continue to put the blocks in place to build something even more special," Koch said. "I look forward to finishing off our USL era in style while simultaneoushly building our club for our next adventure next season."